The Richard M. Fairbanks School of Public Health was pleased to present IU Health with the Spirit of Philanthropy Award for their support of the IU Health Law Scholars program on April 4, 2017. The IU Health Law Scholars Program recognizes the academic achievement of highly qualified students who are pursuing health-related joint degrees. 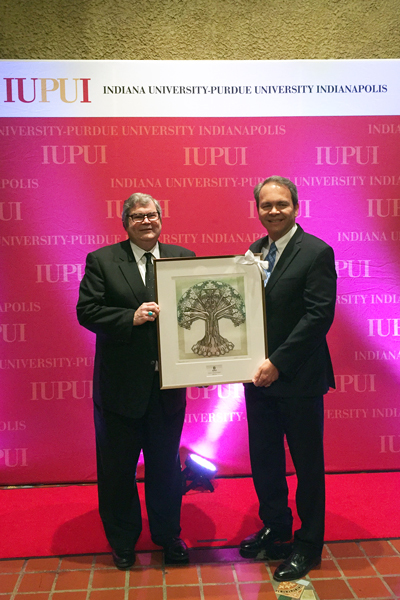 The award was accepted on behalf of IU Health by Dr. Al Gatmaitan, IU Health Executive Vice President and Chief Operating Officer. Thanks to the generous support of IU Health, students selected as IU Health Law Scholars will receive scholarship support, experiential learning opportunities, and co-curricular developmental opportunities. The Spirit of Philanthropy Award is presented to individuals and organizations that have demonstrated dedication and commitment to the academic and cultural well-being of IUPUI and its faculty, staff and students through generous donations, volunteerism and other notable investments. The Richard M. Fairbanks School of Public Health is recognizing IU Health at the 2017 Spirit of Philanthropy event for their generous support of the IU Health Law Scholars Program. Dr. Lacey hosted the faculty of the Product Stewardship program this week for a two-day teaching retreat in Indianapolis. An industry-academic partnership, the faculty are comprised of subject matter experts from Fortune 100 companies across the country. "In the next 12 months the Product Stewardship faculty will be working closely with IU's eLearning Design & Services team as well as the Center for Teaching & Learning to continue to make this program increasingly accessible to students globally." The recently approved Master of Science degree in Product Stewardship is set to launch in Fall 2017. Dr. Hongmei Nan, Associate Professor in Epidemiology, will give a presentation at Lilly US Health Outcomes on Friday, April 21. The presentation will focus on “Pharmacogenomics research on colorectal cancer: an example of precision medicine”. Congratulations to Mark Daiuto and Lindsey Lazo on being awarded the 2017 Plater Civic Engagement Medallion. The William M. Plater Civic Engagement Medallion is designed to honor graduating IUPUI students who have shown an exemplary commitment to the community and who have developed an ethic of civic mindedness. This engagement includes activities such as volunteer or pro-bono service at a non-profit agency, participation in service learning courses, voluntary service abroad or involvement with a faculty member on a community-based research project. 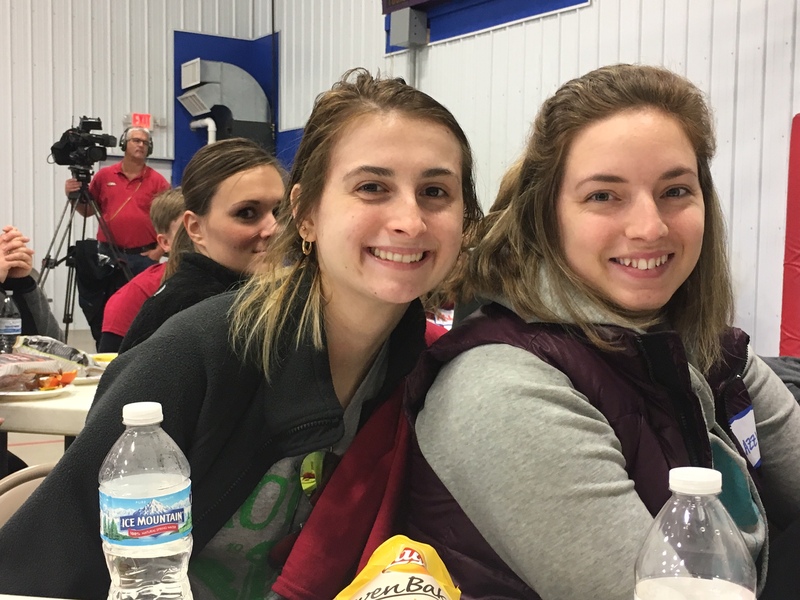 Last Friday, FSPH students joined the IUB School of Public Health, Scott County Health Department and 25 others from Scott and Jackson Counties to clean up Austin Park, Beechwood Park, Lake Iola and along Highway 31. This group was organized as a part National Public Health Week. Professor Debashis Ghosh, Chair of the Department of Biostatistics and Informatics at the University of Colorado School of Public Health, will present, "Model Selection and Estimation for Causal Inference," on Friday, April 21, at 1:00 pm, in HITS 3139. In many observational data settings, there has been tremendous recent interest in trying to estimate causal effects. Two natural questions that arise involve how to conduct model selection in this setting and how to adjust for confounders. What makes the first question nonstandard relative to regression modelling is that typically two models, a mean outcome model and a propensity score model, are fit to the data, and these models play different roles in the causal modeling process. In this talk, we will describe a predictive LASSO approach for addressing question one. For question two, we will develop a G-computation approach based on sufficient dimension reduction to confounder adjustment. This methodology has the surprising finding that sufficient dimension reduction can be viewed as a form of "collaborative" estimation between the outcome and propensity score models. Time permitting, we will describe a recently developed approach based on margins that leads to a natural form of balance in the causal inference setting. Sign up for a campus-wide safe zone ally training and trans 101 training. Both events occur during LGBTQ+ Jag Pride Week. Sign up for both trainings here. Dr. Yolanda Treviño, Assistant Vice President for Diversity, Equity and Multicultural Affairs at Indiana University and Dr. Jack Schmit, Assistant Dean of the University Graduate School and IU-MSI STEM Initiative Director at Indiana University, invite you to learn more about the IU-MSI STEM Initiative through two information webinars on Friday, April 21 and Tuesday, April 25. Dr. Schmit and Dr. Treviño will share details about the IU-MSI STEM Initiative, funded by a grant through the US Department of Navy. A major part of the grant provides funding for faculty research collaboration and student research experiences. If you would like to learn more about the Initiative before the webinars, please visit our webpage at http://stem.indiana.edu. For more information about the webinars please contact Sarah Larson, IU-MSI STEM Program Coordinator. The IU Simon Cancer Center is currently accepting abstracts for posters to be presented at Cancer Research Day, which is Wednesday, May 17. Students, fellows, and faculty conducting cancer research at IUPUI, Indiana University-Bloomington, Purdue University, and the Harper Cancer Research Institute, a collaboration between the IU School of Medicine and the University of Notre Dame, are eligible to present at Cancer Research Day. Cash awards will be given for best poster(s) in each research category, by group. A panel of judges will be assigned to review abstracts and posters by research category and group. Visit http://www.cancer.iu.edu/education/crd/form.shtml to complete the abstract submission form. The deadline to submit is 5 p.m. Friday, April 21.